Cities are hot and often dry. The soil is dry for many reasons. This makes the plants dry and unhealthy. But what about the animals? They need water too. They can gain water by ‘drinking’ from moist soil or dew, or by eating plants that are mostly water. But what if they can’t find enough to drink? 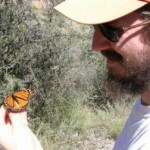 Kevin McCluney was a postdoc in our lab and wrote a paper showing urban insects are in fact drier or thirstier than insects in natural areas. 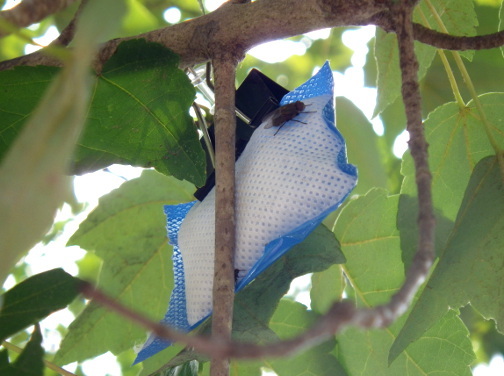 He figured this out by catching insects in urban and natural places, weighing them, drying them, and weighing them again (wet weight – dry weight = water content). 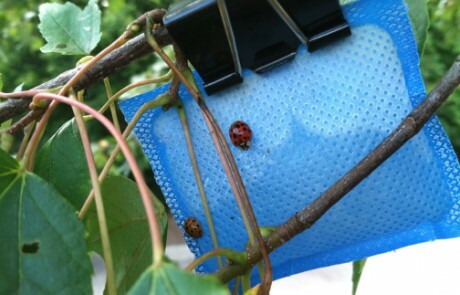 So, what does it matter if urban insects have less water content than normal? Well, some probably die or leave cities, which changes (reduces) the diversity of insects in the city to perform the jobs that insects do. It could be biocontrol, pollination, consuming dung, or just being pretty. 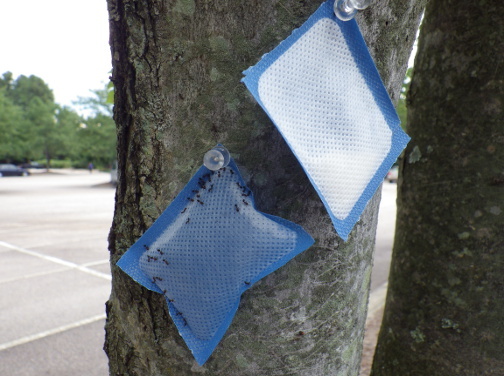 Kevin found that if he provided water in the form of small, saturated sponges stapled to trees in parking lots, it attracted a lot of insects, which covered the sponges, drinking in the water. 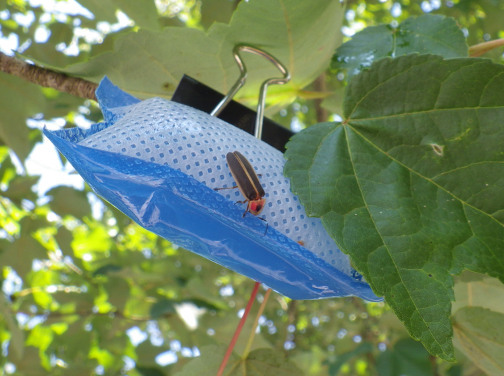 It looked weird, but providing supplemental water on trees increased arthropod abundance and arthropod water content, which changed the arthropod community. 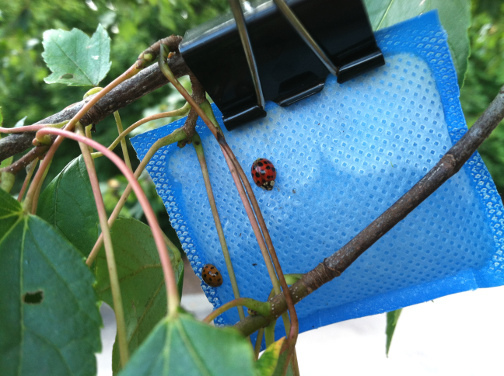 Some examples of arthropods–ladybugs, a fly, a firefly, and ants–that visited the saturated sponges (but not dry ones) in the experiment. Photos: Kevin McCluney. 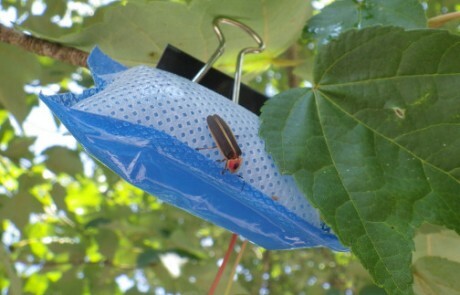 Does this mean we need to start filling tiny bug baths (akin to bird baths) so insects can drink too? 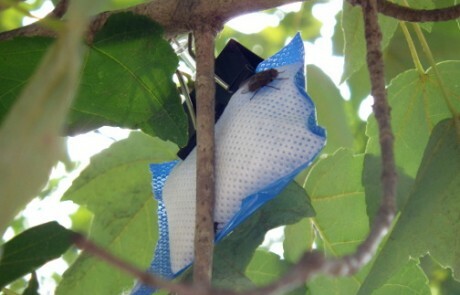 Probably not, but cooling urban habitats with more trees and less impervious surface will ease arthropod thirst and could help bees and other arthropod communities persist. Flowers that provide nectar also give insects a drink. McCluney, K.E., George, T., Frank, S.D. 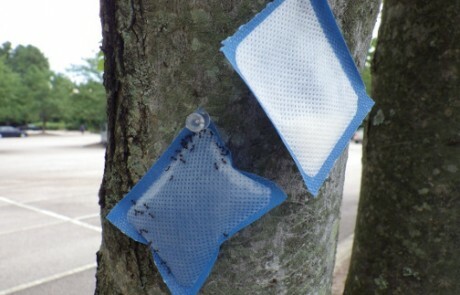 (2018) Water availability influences arthropod water demand, hydration and community composition on urban trees. Journal of Urban Ecology, 4(1): https://doi.org/10.1093/jue/juy003. This work was funded by the USGS Southeast Climate Science Center and USDA NIFA.